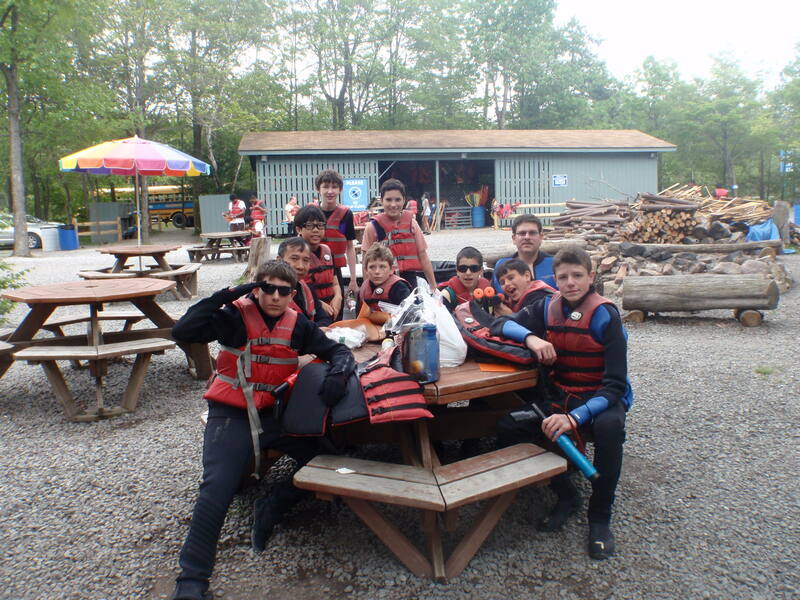 One of the favorite trips of our scouts is the annual white water rafting trip in the Lehigh Valley of the Poconos! It is easy to see why too as this trip is pure fun with no real “work” involved and a relaxing 5 hours cruising down the Lehigh River Gorge and engaging in numerous water fights with the many other rafters! The troop attends on the special Dam Release day that helps to create Class III rapids in some sections of the river. Participants must wear wetsuits & insulated booties and so are oblivious to any rain. To be sure, there is a scouting theme here. The scouts are expected to “earn” at least 10 hours of scouting community service leading up to this event. Additionally, the scouts prepare by reiviewing Safety Afloat (1st Class, #9a). The boys have a newfound appreciation of the importance of following acquatic safety rules the first time they get tossed from the raft (frequently!). Scouts are also encouraged to invite their friends as well as all other members of their family! Parents tend to appreciate the fact that all family members are invited, creating a fun, in-expensive family memory! As you can see in these pictures, fun was had by all! One of the admittedly cooler scouting events of the year is the bi-annual Beach Jam event at Morey’s Pier in Wildwood, NJ. This hugely popular event has been running for 16 years and attracts both boy and girl scouts from several states in the Mid-Atlantic and the Northeast. Indeed, it tends to be a popular family event with hundreds of scouting families present. This year a few adventurous girl scouts from Canada, that had traveled over 12 hours by bus, ventured into our campsite to visit as well as swap patches. The boys seemed impressed with the girl’s willingness to endure a 12 hour bus ride given that the drive from Westchester was only about 4 hours and they got some nifty Canadian girl scout polar bear patches too. The afternoon and night are filled with a lot of unstructured free time, which can be a valued learning experience (believe it or not!). It gives the scouts time to be curious and creative and to explore their world, including the all the amusement park rides. This protocol also actually rigorously tests the buddy-system. As proof, one of the newer scouts ended up missing around the 10pm Saturday night curfew, because he and his buddy got separated and the errant scout independently decided to spend some extra time in the Arcade on the board walk. Until the boy was found, there was a bit of angst on the part of the scout buddies (and parents) and this proved to be a terrific lesson to learn how serious it is to stay together with your buddy at all times. After our first trip to Wildwood a few years ago, the troop decided to skip the offered merit badges as the standards of learning were not as high as the adult leaders would like to see. As you can imagine, this strategic decision to skip merit badge class did not bother the scouts at all as it meant they had more time to play on the beach or ride the amusement rides, as these these pictures can attest! Troop 353 is constantly looking for new and better “best practices”. One of the better ideas the troop has adopted in recent years is for Life Scout candidates to create, market, organize and lead a 6-hour community service project as a preparation “warmup” for a scout’s Eagle Leadership Project. One of the quickest projects our scouts can do is lead a major “spring cleanup” of the extensive grounds of the Immaculate Conception Church where our troop stores its troop gear for free. This exercise led to an accumulation of far more garbage than imagined as well as a surprise finding of a large old marble sign. The troop leaders look forward to an array of additional Life Scout Service Projects in coming years. For a few great pictures from a sunny but cool day in April, click here! 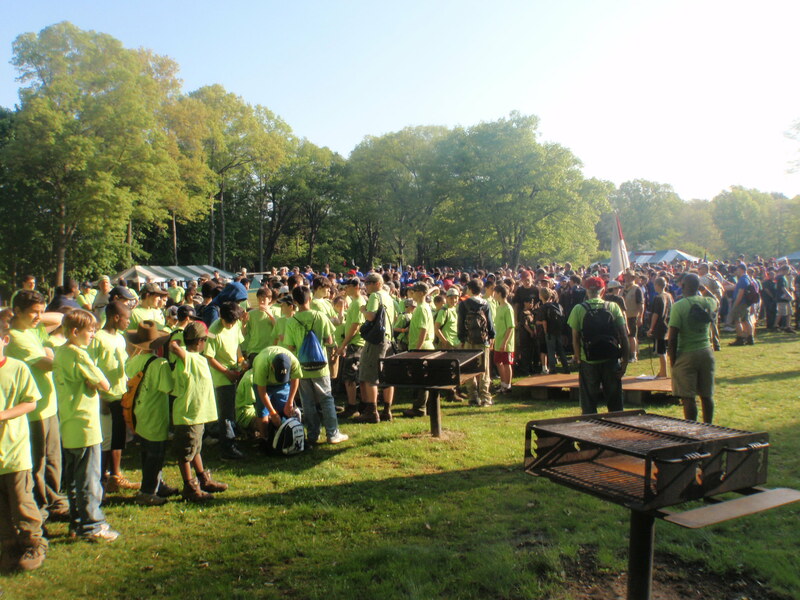 At the end of April, Westchester-Putnam Council celebrated the Centennial by sponsoring a very well-organized and well-attended Camporee at Blue Mountain Park in Peekskill, NY. The enormously ambitious program, attended by over 55 area Scout Troops, consisted of wall climbing, archery, canoeing, tomahawk-throwing, tribuchet challenge, fly-fishing, geo-cacheing, dodge-ball, Segway obstacle course and several other field activities. Troop 353 scouts participated in every aspect of this full day event, including the giant tug-of-war on Friday night. On Saturday, the rock climbing, tomahawk-throwing, Segway obstacle course and giant dodgeball tournament proved to be the more popular of the events. At night, the scouts assembled for terrific bonfire and a major skit competition and lots of other entertainment, topped with a celebratory cup cake for each person. 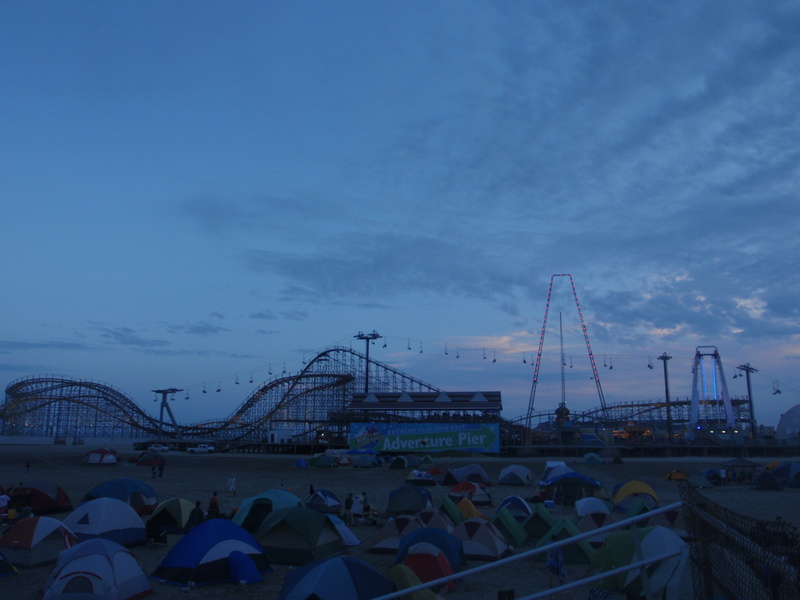 The evenings were as magical with as the days with literally thousands of camp lights giving the atmosphere of a massive carnival. Although the camping space was at a premium, creating some predictable challenges, it was well-organized. There was even a substantial display of historic Boy Scout badges, books, and other paraphanelia that rivaled a small museum. All in all, it was an extremely memorable event as these great pictures can attest! Author scoutmasterPosted on May 2, 2010 February 27, 2011 Categories Activities, Camping, Events, PhotosLeave a comment on Centennial Camporee Draws Thousands!